Many people have come from other parts of the state and are staying in neighbouring villages. Police said the visitors were camping in nearby villages of Sanaswadi and Loni Kand. Police had been carrying out route march in the adjoining village to ensure maintain law and order. Ashok Athawale, a villager from Sanaswadi, whose house and fabrication workshop was set on fire during the riots, welcomed visitors. “We lost our house in the riots and had to leave our village. However, this time again, we are offering free food to nearly 500 visitors,” DNA quoted him as saying. The government has taken extra precautions in terms of giving permission for public rallies. In fact, no one has been allowed to hold a rally near the victory pillar itself and all will be held nearly 500 metres from the pillar. Chief Minister Devendra Fadnavis said that every year, the state allowed different leaders to hold rallies there. “But if anyone is trying to ruin the law and order situation, then no permissions will be given,” he added. Minister of state for home (rural) Deepak Kesarkar said they would deploy 5,000 police constables, 12 platoons of the SRPF, 1,200 home guards under the inspector general of police will oversee security measures. A leading portal quoted a senior police officer as saying that Milind Ekbote and members of the Kabir Kala Manch had been barred from visiting the area. Some members of the KKM are accused in the Elgar Parishad case. 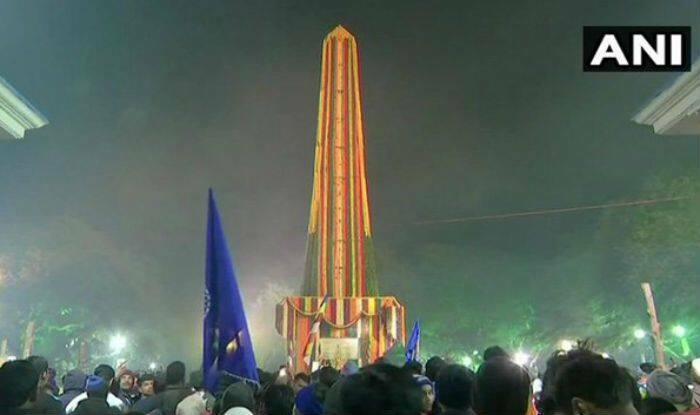 Provocative speeches at the Parishad (conclave), funded by Maoists, on December 31, 2017, allegedly triggered violence at Bhima Koregaon the next day. The Maharashtra Control of Organised Crime Act has been invoked against a gang operating in the district. The administration said seven to ten lakh people are expected to visit the war memorial.